TV announcers: Ernie Johnson Jr., John Smoltz, and Cal Ripken Jr. 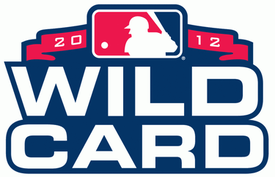 The 2012 American League Wild Card Game was a play-in game during Major League Baseball's (MLB) 2012 postseason played between the American League's (AL) two wild-card teams, the Texas Rangers and the Baltimore Orioles. It was held at Rangers Ballpark in Arlington, Texas, on October 5, 2012, at 8:37 p.m. EDT. The Orioles won by a 5–1 score and advanced to play the New York Yankees in the AL Division Series. The game was televised on TBS. The Orioles scored their first run of the inaugural AL wild-card game when J. J. Hardy knocked in Nate McLouth with his RBI single. The Rangers answered in the same frame when Ian Kinsler scored on a double play grounder by Josh Hamilton. After the first inning, both starters, Joe Saunders and Yu Darvish pitched shutout baseball until the sixth inning when Adam Jones knocked in a run via sacrifice fly. Darvish was charged with another run in the seventh via a Nate McLouth RBI single. The Oriole relievers would prove enough to take care of Rangers lineup the rest of the way. The Orioles scored two insurance runs off of Joe Nathan in the final frame to seal a 5–1 victory. "Two Column Box Score:Baltimore vs. Texas – October 5, 2012". MLB.com. October 5, 2012. Retrieved October 16, 2012. "Baltimore Orioles at Texas Rangers – October 5, 2012 | MLB.com Play-by-Play". MLB.com. October 5, 2012. Retrieved October 16, 2012.